Regular job applications can be pretty tedious and impersonal - you’re left to fill out a bunch of forms, and respond to a few criteria, but don’t have an opportunity to show who you are. Even if you make it to the interview, it can still be hard to relax enough that you stand out and show what you’re capable of, rather than trying to fit a mould. Nhi Huynh found this with many of her job applications but, after participating in Paddl Games, loved how she began to form real connections with mentors and like-minded students from a wide range of fields. Her Paddl journey began during the first year of her engineering degree, when she applied to take part in the Metro Trains Scratch Space Challenge. Since then, Nhi has participated in SIX Paddl Games, developing her experience and demonstrating her skills to hiring managers from organisations such as Metro Trains, AGL Energy, Australia Post and Canon Australia. We caught up with Nhi to see what she's been up to since her last Paddl Games Challenge with Bunnings, and to find out why she thinks it's so important to collaborate, get to know other people and let you personality shine through. We first met you during The Metro Scratch Space Challenge back in 2017! Have you been up to anything exciting since then? After the Metro Scratch Space Challenge, I spent two months on the Mars Home Planet 3D Modelling Challenge. I worked in a team of 7 to create an architectural concept and 3D model of a habitat for 1 million people to live on Mars. We researched existing technologies on Earth, the martian environment, and the possibility of colonisation. We then generated potential designs that were constrained to harsh martian living conditions, while being utopian enough to inspire a future on Mars. It was also awesome to have the chance to speak with an International Space Station Resource Manager and experience Mars in VR. Can you tell us more about what you worked on in your first few Paddl Games? How you would describe the experiences? The two Paddl Games challenges I participated in with Metro Trains Melbourne both involved solving transportation-based problems. In the Metro Scratch Space Challenge, I worked in a team of six on a 5-hour ideation project based on improving passenger experience during planned and unplanned disruptions. The second challenge was the Metro Skunk Works Challenge, where I was a part of a multidisciplinary team of 16, developing innovative solutions to improve passenger safety in emergency situations. The scope of the problem was colossal as the infrastructure involved 869 kilometers of rail, 420 trains, 212 stations, 400,000 passengers, and 3500 Metro staff. We only had three weeks to ideate, refine, test and prototype this solution! These are both huge projects, what would you say you gained most from your experience as a Paddl Games participant? I was fortunate to have extremely talented teammates from various fields and to be supported by industry mentors from Metro. Learning to work alongside so many different types of people, understanding how they think and work was fantastic! I also gained exposure to different frameworks, systems, and procedures deployed to manage massive infrastructure and millions of rail users. I think learning this helped me become more confident in utilising new methods and frameworks to devise solutions for clients, while learning new software, such as the prototype-on-paper app for rapid user interface design, has shown me new ways to work efficiently. I was also really glad to get the chance to talk to the current Metro employees and Paddl staff. Everyone was really knowledgeable in fields of innovation and strategy, which meant I could get to know them, as well as learn more from them about what I could do in the future. 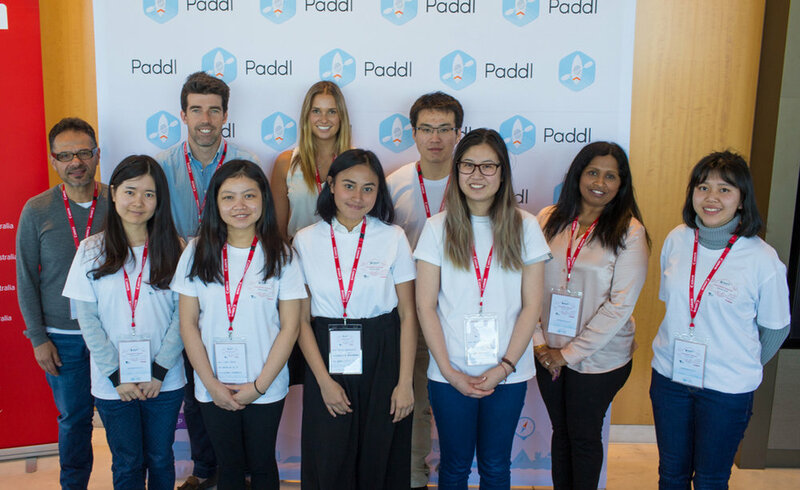 Since you participated, we’ve had you back as one of our Paddl Alumni during the COSBOA Innovation Games and our most recent Paddl Games challenge with Bunnings. Can you describe your role? Any tips or trick on what participants can expect? As a Paddl Alumni, one of my goals was to ensure that everyone had the best learning experience possible. Before the challenge, in our private team channels through Slack, we researched the companies, their product, and the market as a team. I also shared my knowledge and perspectives to kick-start ideas in the Slack channel. During the day, I facilitated discussion, contributed some ideas, and helped guide everyone in the right direction and made sure that progress was made in time in each design thinking sprint. As a team, we expanded our analysis and communication skills and widened our knowledge of cutting-edge technology in each industry. Most of all, we learned how to critically evaluate different solutions in a short time frame. This allowed us to devise an outcome that best suited the business we were working with, since every business was distinct. Have the goal, budget, expansion plan and operating attributes of the involved business in mind. The recommended solution should be implementable and its risks need to be well-managed. Ideally, it could also generate extra revenue, save significant cost for the business, and open up new potentials for the business to pursue or expand in upcoming years. Be open to new ideas, perspectives and approaches from each other. A collaborative and respectful approach will deliver results. You’ve mentioned the importance of collaboration quite a bit - in fact, collaboration is one of the top 7 skills Paddl thinks everyone should develop in 2019! Why do you feel it’s so important? Sometimes I worry that my resume and cover letter will drown amongst other applicants’ - it can feel like a bit of a lottery! My Paddl experience, especially at Paddl Games, showed me that self-expression and getting to know and work with other people is really important because you never know how one opportunity can lead to another. I was accepted to the Metro Skunk Works I think in part because I had an advantage by volunteering for the Scratch Space before! If you present yourself well to everyone, get to know people and treat everyone with respect, I think you'll set yourself up well for the future by showing them who you really are. Paddl is different from other job searching platforms because people answer simple questions and build one experience profile. It’s a better way for people to express themselves! Paddl Games are also very interesting because it lets employers meet people in person and allows them to learn more about each candidate. I don’t know how recruiters do their job without meeting people from organisations or meeting people they’re sending through, and Paddl Games is an awesome way to sort through people for roles by actually seeing their experience and personality before hiring them later on! Like Nhi, you can take part in our upcoming Paddl Games and make the most of an awesome opportunity to develop your collaboration skills and show your personality. To get involved, and to find other opportunities through Paddl, sign in to your Paddl Profile and add some Activity Cards to showcase experience to potential employers. If you don’t have a Paddl Profile, create one today! You can also stay up to date on upcoming opportunities by following us on Facebook, LinkedIn, Instagram and Twitter!